People of conscience have a moral responsibility to oppose BDS and support a just peace for Israelis and Palestinians alike. This is the agenda of the boycott movement against Israel, in its own words. 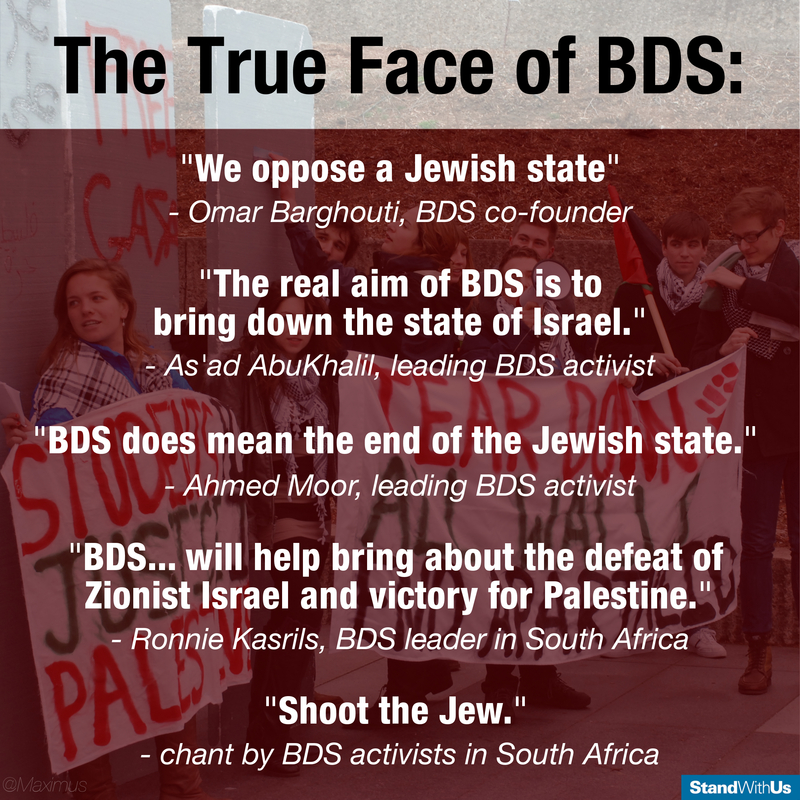 BDS is a barrier to a better future for Israelis and Palestinians alike. 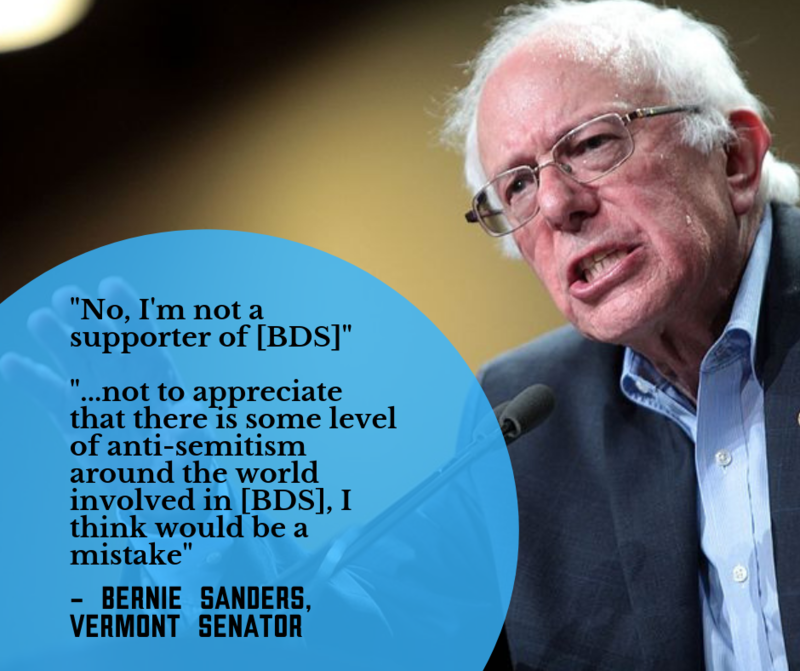 Even Bernie Sanders, a harsh critic of Israel, opposes discriminatory boycotts against the Jewish state. 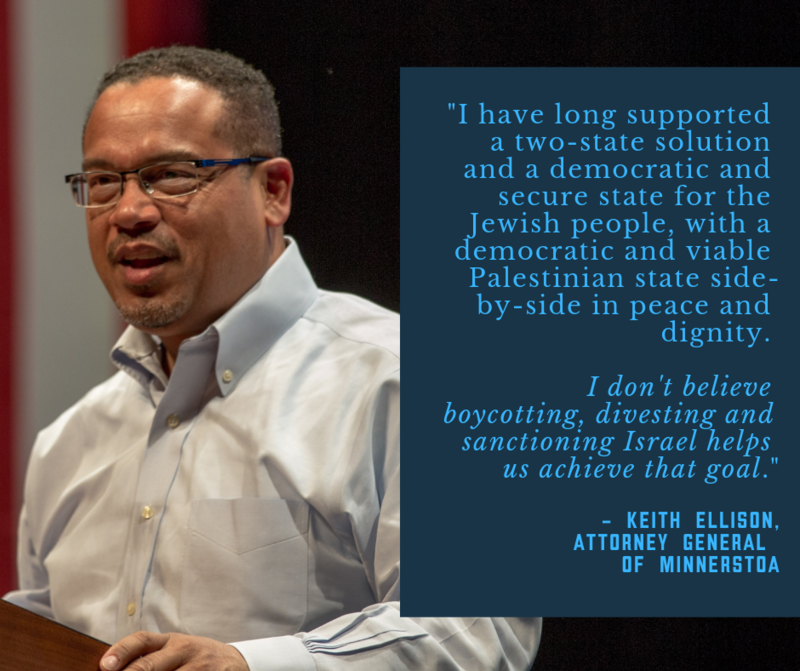 Even Keith Ellison, a harsh critic of Israel, opposes discriminatory boycotts against the Jewish state. BDS actively perpetuates the conflict. It explicitly demands that people boycott joint programs that promote coexistence, cooperation, and peace between Israelis and Palestinians. BDS uses progressive rhetoric to promote a fundamentally unjust cause: the elimination of Israel and the violation of Jewish rights. Leading BDS activists openly admit that their goal is the elimination of Israel, and not a Palestinian state living alongside Israel in peace. BDS cynically exploits the narratives of oppressed peoples while promoting injustice for Israelis and Palestinians alike. Opposing BDS doesn’t mean you oppose justice or Palestinian rights. It simply means that you believe Palestinians can be free without forcing the Jewish people to go back to being a stateless minority. BDS portrays itself as the true voice of the Palestinian people, disregarding the many Palestinians who disagree with its destructive agenda. Divestment increases divisions between communities here while perpetuating further conflict and injustice in the Middle East. 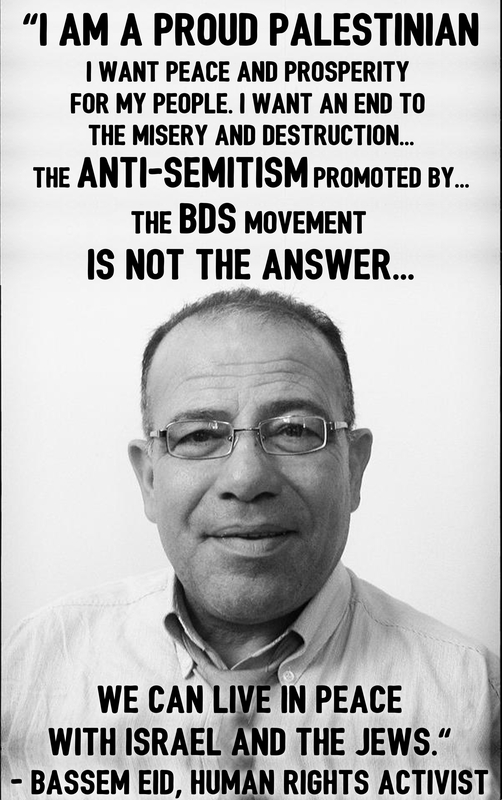 BDS promotes academic boycotts, which have been overwhelmingly condemned as textbook violations of academic freedom and the free exchange of ideas. Academic boycott campaigns in the United States receive fiscal sponsorship from a hate group that promotes racism and supports terrorist groups. Who funds BDS on campus? BDS activists exploit progressive causes and minority groups on campus, while taking money from an off-campus organization with disturbing connections to genocide denial, homophobia, sexism, racism, and terrorism. "Criticizing Israel is not anti-Semitic, and saying so is vile. But singling out Israel for opprobrium and international sanction -- out of all proportion to any other party in the Middle East -- is anti-Semitic, and not saying so is dishonest." This is a powerful statement about how anti-Israel activists abuse and exploit the voices of Jews of color from the Middle East and North Africa. This article makes a strong argument about how boycotts and one-sided pressure against Israel are harmful to Israelis and Palestinians alike.